TORONTO - A Toronto-area teacher who backpacked through Europe and slept on couches this summer was unaware he had a winning $21-million Lotto Max ticket stuck to his fridge at home. Craig Henshaw, 42, said Tuesday he bought the ticket at a gas station in July, pinned it to his fridge with a bunch of other tickets and left for Europe a few days later. He forgot about the tickets over the summer. But once school started again, he realized he had a stack to check through. 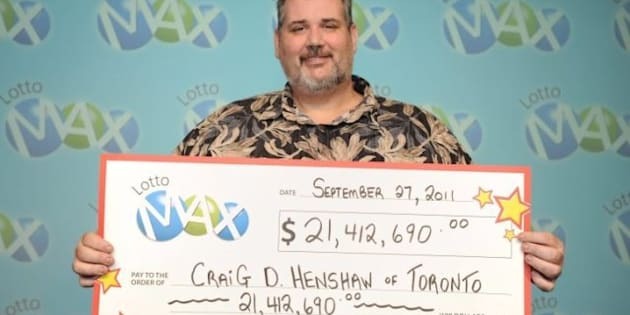 "I had no idea I had $21 million sitting on my fridge at home," he said after being presented with an oversized cheque. "I wouldn't have been living out of a backpack for two months if I'd known (about the money)" he added. Clad in a Hawaiian print shirt, Henshaw said he was ready to travel some more. He plans to take his whole family on a trip and return to Europe with his girlfriend. But this time they won't be sleeping on any couches, he said. Henshaw said he spent a day walking around with the winning ticket in his pocket before checking it at a grocery store on the way home from work. Initially believing he had won $21,000, he dropped his phone when a lottery official told him the ticket was in fact worth $21 million. The wood shop and technology teacher called in sick Tuesday before claiming his prize at the Ontario Lottery and Gaming prize centre in Toronto. "Surprise! I'm not really sick," he joked in front of TV cameras. "There's no checkmark or box in the absence form that says 'lottery winner,'" he explained. "It just says 'personal illness' or 'funeral' — and this is way better than a funeral." The lucky numbers — a random "Quick Pick" combination — left Henshaw the only winner of the July 8 jackpot. Henshaw said he'll use some of his winnings to pay for his nieces' and nephew's post-secondary education, and possibly to get married to his girlfriend. He plans to take a year off from teaching, but said he enjoys it too much to imagine a future without it.